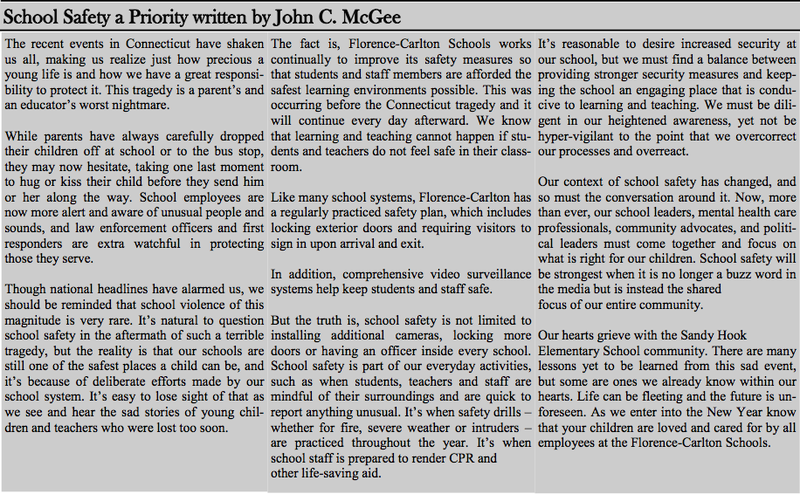 Plagiarism by Florence Carlton Superintendent John C. McGee in School Safety Article CONFIRMED! The recent events in Connecticut have shaken us all, making us realize just how precious a young life is and how we have a great responsibility to protect it. This tragedy is a parent’s and an educator’s worst nightmare. While parents have always carefully dropped their children off at school or to the bus stop, they may now hesitate, taking one last moment to hug or kiss their child before they send him or her along the way. School employees are now more alert and aware of unusual people and sounds, and law enforcement officers and first responders are extra watchful in protecting those they serve. Though national headlines have alarmed us, we should be reminded that school violence of this magnitude is very rare. It’s natural to question school safety in the aftermath of such a terrible tragedy, but the reality is our schools are still one of the safest places a child can be, and it’s because of deliberate efforts made by our school system. It’s easy to lose sight of that as we see and hear the sad stories of young children and teachers who were lost too soon. FLORENCE – The superintendent of the Florence-Carlton School District has apologized to the school board after he plagiarized a column written by a Georgia school official and published it as his own in the school’s monthly newsletter. McGee is the Florence-Carlton superintendent. However, the entire column was actually written by Robert Avossa, superintendent of the Fulton County School District near Atlanta, Ga. His column, an emotional response to the Connecticut school shootings, was published on Dec. 26 in Neighbor Newspapers, a suburban Atlanta media outlet. In the column, Avossa referred to Fulton County Schools several times. However, in the Falcon View column plagiarized by McGee, Florence-Carlton was substituted for Fulton County. Other than that, and the omission of a reference to the specific number of police officers at Fulton County schools, the article was unchanged and copied word for word. On Jan. 3, an anonymous blogger posted a link to both articles on a website dedicated to Florence school news called Florence Carlton Advocates for Better Education. The blogger suggested plagiarism on the part of McGee, and the link was shared on a public Facebook page called Florence Carlton Review. McGee subsequently reported what he had done, and the fact that community members were already aware of it, to the school board. During a special school board meeting, he apologized and was told by the board to write a correction in the February edition of Falcon View and also write a letter of apology to Avossa, which he did. The correction is on page 2 of the February edition. The special board meeting also included a prescheduled annual evaluation of McGee’s job performance. School board trustee Vickie Cornish said as far as the board is concerned, the incident has been dealt with. McGee, for his part, said he accepts full blame for what happened. McGee, who works with his administrative assistant to lay out the newsletter every month, said he knew that including his name was wrong before the publication went to print, but he was in a rush to get it sent out in time. “What happened was there was an article written by a superintendent out of Fulton County, Georgia,” McGee explained. “It was very inspirational … words that could easily apply to our district. We published it without credit being given to that superintendent. My main administrative assistant had taken a vacation to attend a wedding over the Christmas break, and we usually have a deadline to get the newsletters out for the first of the month. People want it because of the hot lunch schedule, and we get calls when it doesn’t come out on time. McGee said he went to the board to report what had happened after the anonymous blogger published the two articles side by side. At the special board meeting, the board moved McGee’s evaluation and explanation of the plagiarism into an executive session, which is closed to the public. McGee said that he sent a letter to Avossa introducing himself and saying his letter had been reprinted without giving proper credit to him for his words. “He has not responded back,” McGee said. “I am glad the board has taken this so seriously. I understand that this is wrong. In no way, shape or form am I trying to make light of the situation. He deserved full credit for it. I am fully aware what I did was wrong. I asked that the board not to take this lightly. I should be held accountable, and nobody else. Copies of the January and February 2013 Falcon View newsletter can be viewed athttp://www.florence.k12.mt.us/domain/30. 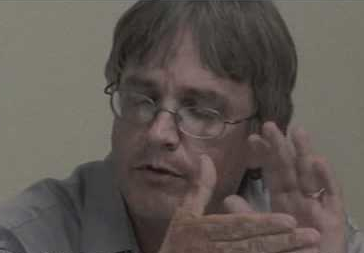 Reach reporter David Erickson at 363-3300 or david.erickson@ravallirepublic.com. Where are all the original thoughts gone??? I really liked this article. As I have had the opportunity to spend some time around John C. McGee I had often thought this is not John speaking or writing. Several Falcon View articles have similar jargon. Do you all remember the article with the line item Activity Account and how solvent he claimed it to be? They couldn’t even come up with the correct total of the account on the front page of the Falcon View. Go back in the archives and add it up, Sadly I took the time to add it up the day it was printed and you can’t imagine the laughter that took place in my home. Our community has a cancer in it’s school system by the name of McGee, followed by 5 tumor’s that support this nonsense.. This article proves to me he (McGee) probably is not too concerned with the Safety of our children. God help us all. This is the Scripture that McGee used in the June 2011 Falcon View article to the Florence Carlton Graduating Class of 2011. I find it ironic that Students from this graduating class exposed his Plagiarism.